There’s a high price to be paid if Britain leaves the European Union, according to the UK’s Treasury forecasts. Leaving the EU would cost the average household £4,300 per year, it is suggested. But Chancellor George Osborne has not done a great job of budget forecasting recently, so why should we believe him on this? It’s important to remember that the Treasury is not predicting household incomes will actually fall by this much. The claim is that they would be higher, on average, by this amount if the UK remained in the EU, due to higher projected levels of growth than for a UK outside the EU. What’s more, this is rather a different exercise for the Treasury than its relatively short-term budget forecasts (which have regularly been over-optimistic about UK productivity growth). These forecasts involve looking over a longer timescale and weighing up hypothetical options. It’s not clear what the UK’s relationship with the EU would be after a Brexit, so the Treasury has modelled three possibilities. One is, roughly speaking, a Norwegian option of membership of the European Economic Area (EEA). This would allow the UK to access the single market but would mean it would have to continue to allow European workers in. Another is a Swiss-style arrangement of negotiating a specific trade agreement with the EU. The third is a wider option which would see the UK reduced to essentially the same relationship with the EU as other members of the World Trade Organization. The further the UK moves away from EU membership, the greater barriers British exporters would face and the less attractive the UK would be to foreign investors, and so the greater the negative impact predicted. Any assessment of an unprecedented scenario such as Brexit is bound to be subject to major uncertainties. And of course no country has ever left the EU. 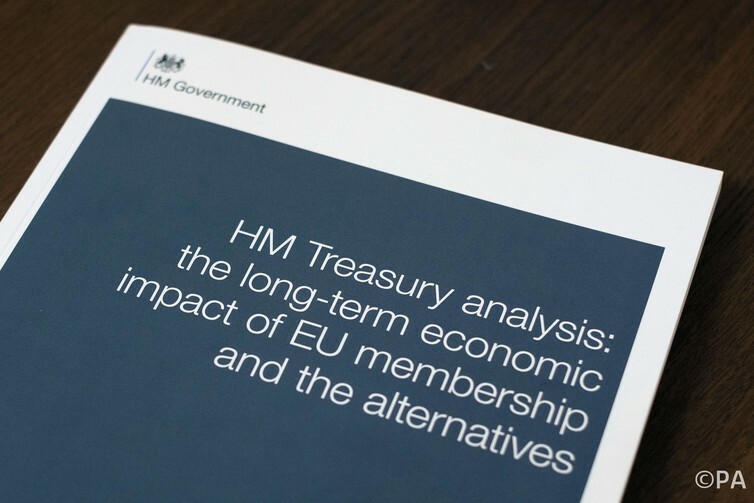 The Treasury assessment is broadly similar to other recent estimates such as those from Oxford Economics and PwC, although it does indicate larger potential losses. The Treasury analysis has several steps. The first is an attempt to estimate how much the UK’s trade and inward foreign direct investment (investment by overseas multinational corporations into the UK) position would be affected by Brexit. This is necessarily speculative, but perhaps particularly so with the Norwegian option given how few countries maintain arrangements of this kind. The key next step is not simply to estimate by how much UK exports and inward investment would be affected, but how this would affect UK productivity growth. In other words, it is not so much the effects on the sheer volume of exports sold to EU countries, but the impact that trade and inward investment are expected to have on productivity through various channels. An important difference between the Treasury forecast and others is that it assumes both a relatively high negative impact on trade and inward investment in the event of a Brexit, but also a relatively strong negative response of this on productivity growth. While the UK would no longer have to contribute to the EU budget (which may be a questionable assumption with the Norwegian option at least), the Treasury says these savings would not be matched (depending on the arrangement chosen) by the loss suffered as a result of the lower projected tax receipts from lower (relative) economic activity. Although productivity growth has been found to be positively related to trade and inward investment, there are significant caveats here. In the medium to long term, a country’s growth depends on being able to raise productivity. It has often been found that trade and inward investment are positively related to productivity growth, but there are formidable problems in deriving direct causal predictions from this. The primary factors driving productivity growth include the willingness of firms to invest in new equipment and R&D, the skills and education of the workforce and a country’s regulatory and institutional framework. Brexit would not necessarily fundamentally change any of these, and the UK’s recent productivity performance remains poor despite current arrangements. The question, though, may be viewed from a different angle. One may query the precise Treasury estimates here, but it would require quite different assumptions to expect Brexit to have a positive impact on UK growth. It is the case that the Treasury has been somewhat over-optimistic of late with its forecasts on British productivity growth. But if those backing Brexit want to tear up this document, they would be advised to produce a forecast of their own, specifying how leaving the EU would improve productivity.